Just like video game warnings, let everyone around you know you are rated B for Birder with this clever game label spoof design. 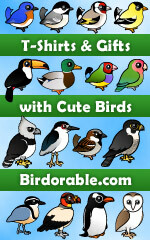 An original and perfect birder gift idea. To order by phone, call toll-free at 1-877-809-1659 from Monday - Saturday 9:00am - 9:00pm EST. You'll need to note the Product Number 030-1266325065 to make your order.